I've read that you can also just install the operating system on an external drive, which will default to HFS. Then you can use Carbon Copy to clone the external to your internal drive. This would take longer, but sounds pretty simple. I wanted to update fcpx on my 2009 macpro but it required an os upgrade which in turn a different hard drive format depending on the type of drive. I quickly came to the conclusion the headaches outweighed the merger benefits (for me). Hey if that's the case, sign me up!! Do you have a link to those commands? That would solve one of two biggest issues I have with HS. Here's one of the guides I used. 1. I used Carbon Copy Cloner to copy my Sierra install which was on an internal SSD in my late-2014 iMac over to an external HDD (spinning disk). 2. I booted from that HDD and went through the High Sierra install routine (took a super-long time). 4. I then used CCC to re-clone from that HDD BACK to my original SSD in my iMac. 5. I booted from the internal SSD, verified it was still HFS+, ran all my critical apps (Davinci Resolve Studio 15 being the biggie) to ensure proper operation and, voila! Now I've got all the benefits of High Sierra minus the annoying and stupid APFS issues. And the best part? DiskWarrior can talk to and repair High Sierra *because* it's still HFS+ format!! It's not really optional. It won't convert spinning drives to APFS, but if you have an SSD, you really have to finagle your way around the High Sierra installer in order to get it not to do that. I did it with my iMac, but it's not the easiest workaround. Internal SSD will be converted. Spinning HD will not be automatically converted, whether internal or external without forcing the update. External SSD will not be automatically converted without forcing the update. The other way to go back is to remove the SSD and reformat the drive externally, restore the data and then reinstall in the computer. This is fairly easy to do in laptops, requires special tools with iMacs and Mac Mini. Jeff, why can't you just do what I suggested above? Install on an external drive and clone back to the internal? I have cloned disks in both directions for other reasons with Carbon Copy. Couldn't be easier. Or is there some reason that won't work on High Sierra? Good question. Apple could turn that method off in the future. Apple could eventually force a check of the formatting of the boot drive at startup and force the startup to be APFS. Folks just need to be aware that things are progressing and changes are coming whether "we" like them or not. From Rob at Barefeats: He noticed that Time Machine is responsible for making all the snapshots (as noted in the articles I shared). 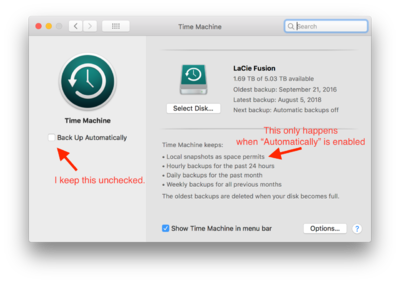 If you uncheck, "Back Up Automatically" then it doesn't create snapshots. And, if you go into "Options" and select the drive you want TM to ignore, this further prevents any auto-snapshots being made. For me however, I needed to keep my SSD as HFS+ so that DiskWarrior can fix the directory, should it need it. Alsoft to date still doesn't not have the code to fix an APFS formatted volume. I'm hoping that by the time Mojave is gold that they'll have DW 6 available. I avoid using TimeMachine all together, just too many issues with it I've seen from others. I would recommend Carbonite or Dropbox, and don't be afraid of just wiping your drive and re-installing your OS. The OS-growing issue has nothing to do with Time Machine. The time machine snapshot issue is not new, it has been discussed for years. But MacOS has been pretty good at freeing up that space when it was actually needed for something. 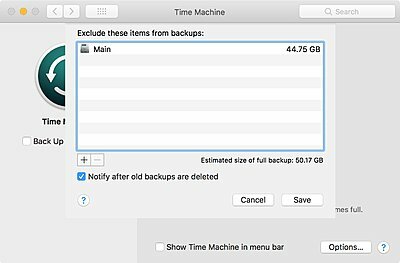 I've been using Time Machine on my laptop for the past 7 years or so and haven't had any problems. I have an Apple Time Capsule and it constantly backs up over wifi. Has come in handy a few times when I accidentally deleted something. But I have a separate Mac just for video editing and have time machine disabled on it. I use Carbon Copy to make bootable clones of all my Macs as well. I would never actually restore a full computer from a Time Machine backup unless all my other options failed, it's just too slow for that kind of thing. Since I was finally able to get a fast FIOS internet connection last year, I now have 4 different computers with a total of about 8TB of data that are continuously backed up to the Cloud with BackBlaze as well. don't be afraid of just wiping your drive and re-installing your OS. My initial research was skewed; I was digging in the wrong direction. It wasn't until those recent articles posted that I had clarity about exactly how/why the OS was growing. But I have a friend who does it every few months. For some reason he's convinced that it solves all kinds of strange problems (that nobody else seems to have). Your friend is right. I don't have commonly reported issues both with new OSes and updates of software like Creative Cloud. I see a lot of things reporting on similarly configured systems that I have that I don't encounter. Now, every few months is overkill, if that's what he's truly doing. I only do it for new OSes iterations (such as High Sierra from Sierra).